This is a simple chicken barbecue for the slow cooker. The chicken and two other ingredients are combined and slow cooked to perfection. Serve this tasty chicken shredded or chopped on toasted buns, and pass the barbecue sauce! Offer coleslaw as a sandwich topping or serve it as a side dish. A creamy coleslaw is excellent with the barbecue flavors, or try this lighter kale and cabbage slaw with a vinegar-based dressing. This recipe calls for chicken breasts, but all or part chicken thighs may be used. Chicken thighs are a good choice if you plan to leave the shredded chicken in the slow cooker for serving; they retain their juiciness better than the leaner chicken breasts. Wash the chicken breasts and pat dry. Put in a slow cooker with 1 1/2 cups of barbecue sauce and the onion. Stir to coat the chicken. Cover and cook on low for about 6 hours or on high for about 3 hours, or until the chicken is tender and cooked through. Remove the chicken breasts to a plate and shred or chop. Return the shredded chicken to the sauce in the slow cooker; stir to blend. Cover and cook for 10 minutes longer. 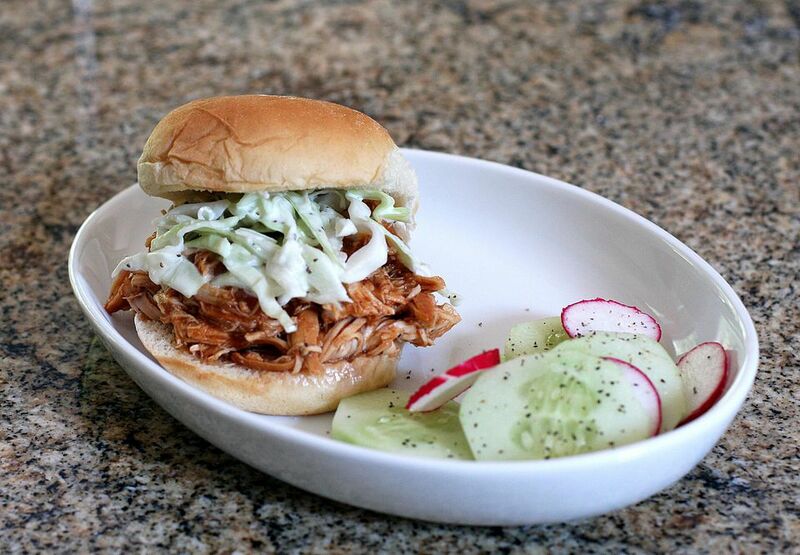 Serve the shredded chicken on toasted buns with coleslaw and extra barbecue sauce, if desired.